Big Water Challenges? Make Small Changes to Make a Difference! UCLA basketball coach John Wooden knows a thing or two about the power of small actions. Consequently, his wisdom could help ease California’s big water challenges. Understand, California’s water crisis is getting worse. And asking residents politely to curb usage isn’t getting the job done. State water regulators earlier this month approved fines for residents who waste water on lawns, landscaping and car washing. Breaking the restriction could result in fines of up to $500. Why? Because water consumption increased. That’s right. Water usage went up during the worst drought in nearly four decades. It may not be long before other parts of the country face the same big water challenges. The oppressive drought in the United States ranges from the Missouri River to the Pacific Ocean. In addition, it affects about one-third of the country. That is around 73 million people, according to the U.S. Dept. of Agriculture’s Drought Monitor report. Guess what though? 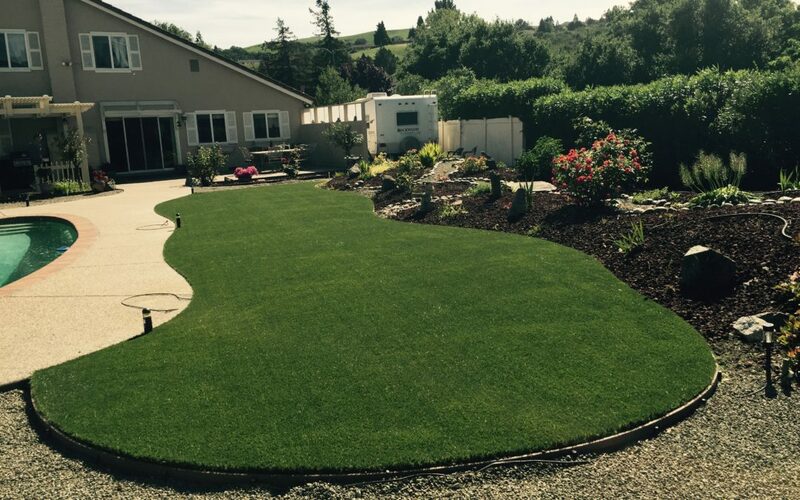 Synthetic grass is an amazing drought tolerant solution. Maybe more Californians and people nationwide should take Coach Wooden’s advice and think small when it comes to conserving water. Want some examples? Consider using water-saving synthetic grass in small places. Here are some creative uses. Airbnb has selected to NewGrass for most of its pop-up parks at entertainment events. Here relaxation is offered community building ways. Airbnb offers games, refreshments, unexpected acts of hospitality, and special events to attendees. Synthetic grass really makes the space come alive. Linden Park in Oakland, used by the North Oakland Community Charter School (NOCCS) for its recess made a change. They turned dry, hard-dirt play areas into safe, clean play areas thanks to NewGrass, installed by Artificial Grass Pros. “It’s a great project that we’re proud to be part of, and it really shows how small things can make a big difference, and in a lot of different ways,” said Jason Webb, president of AGP. In New York City synthetic grass provides the floor covering for Soaked, a skyscraper-topping, outdoor bar atop the Mondrian SoHo hotel. NewGrass® has provided the ground cover for Park Here. This is a 0.1-acre temporary indoor pop-up park in the Nolita neighborhood of Manhattan. To find it go north of Little Italy and Chinatown. You will find it has the same landscaped balcony terraces of the ultra-modern Trump Place. NewGrass is also part of PARK(ing) Day, an annual worldwide event in which artists, designers and neighbors transform metered parking spots into temporary public parks. Per our NewGrass president, “We agree with Coach Wooden, little actions can have a big impact. It’s like [State Water Control Board] chairwoman Felicia Marcus said when her agency approved the new fines: ‘Every action, contributes to every community’s water security.’” In other words, we can make an impact on water conservation. Every little bit helps. So if you have questions about your lawn, contact us. NewGrass has answers for your big water challenges. Our products use some of the latest industry technology. Also, our product diversity is hard to beat. We have a look for every taste and will work with your budget to achieve the look you want. The consult is free and we will even send samples for you to look at and touch. NewGrass is the answer for California water challenges. And since we are nationwide, we are the answer for to your challenge too! Our reps are standing by to answer your questions. We would love to have another NewGrass customer!